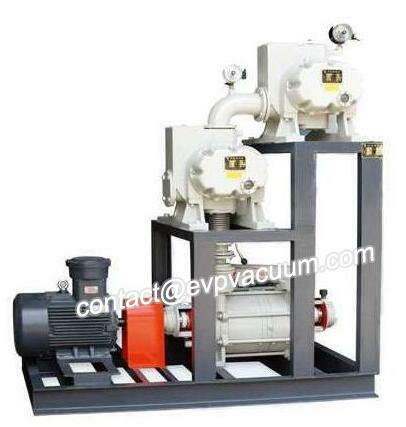 Roots Vacuum Pump Used in Vacuum Furnace- Vacuum Pump - EVP Vacuum Solution! The vacuum required for smelting Ni-based and Fe-based superalloys in vacuum induction furnaces is generally in the order of 0.133 3a (10-3 Torr). The vacuum system consists of three stages: oil injection booster pump – Roots vacuum pump – mechanical vacuum pump. Most of the mechanical vacuum pumps used as front-stage pumps are sliding valves. This type of pump has the advantages of compact structure, small floor area and convenient installation. Slide valve vacuum pump belongs to oil seal pump. The gas entering the suction port is compressed by the rotor in the pump, and then enters the fuel tank through the exhaust valve sheet. When the pump is running, the oil in the tank lubricates the bearing and seal of the pump through an electromagnetic valve or a small oil pump. The disadvantage of sliding valve pump is that it is sensitive to a large amount of ash pollution. The ash content in the burden of vacuum induction furnace is relatively large, which will volatilize during the process of vacuum pumping and smelting, a small part of which will be adsorbed by the furnace wall, and most of which will be discharged into the oil tank of the slide valve pump, thus polluting the pump oil. Over time, the pump oil becomes muddy. Because the gap between the pump body and the rotor is very small, the mechanical impurities enter the pump chamber to condense into small blocks, so that the rotor is scratched, forming a through annular groove, thus reducing the ultimate vacuum of the sliding valve pump, and in serious cases, the rotor is stuck and can not rotate. In the process of vacuum induction furnace smelting, alloying elements such as Al and Mg are often added. These elements are easy to volatilize, which greatly shortens the service life of the slide valve pump. Sometimes, the pump that has just been replaced is stuck for hours and can’t rotate, so that the furnace can’t continue to run. It not only affects the production, but also increases the maintenance workload and the consumption of mechanical pumps, oil and spare parts, and increases the operating costs. Another disadvantage is that it is very sensitive to water vapor in the gas. In the initial vacuum stage, water vapor adsorbed in the furnace wall and charge is sucked by the pump and compressed in the compression chamber. The saturated vapor pressure of water is 19918Pa (149.4Torr) at the corresponding temperature (e.g. 60 C). Once the vapor reaches the above pressure, it begins to condense into water and mix into oil. The vacuum performance of the oil is deteriorated, which affects the limit pressure and pumping rate of the pump. In view of this, in order to solve the problem that the mechanical pump of 3000-pound vacuum induction furnace in our factory is easily damaged for a long time, we choose the domestic Roots vacuum pump unit with the same pumping speed as the sliding valve pump to replace the sliding valve pump, which has achieved good results. Roots vacuum pump unit is composed of oil ring pump and Roots pump, and its pumping rate is determined by the matched Roots pump. Roots pump does not need oil to lubricate the pump chamber, there is no problem of oil deterioration; ash will not accumulate in the pump, ash pollution is not as sensitive as mechanical sliding valve pump. The function of oil ring pump is as the front pump of Roots pump. Oil and gas separator, heat exchanger, check valve and other devices are designed for oil ring pump. The gas is inhaled by Roots pump, compressed by oil ring pump for the second time, and then enters the oil-gas separation cooling box. After oil-gas separation, the gas is discharged to the atmosphere. The oil in the tank is cooled and returned to the pump. A check valve is installed at the inlet of the oil ring pump to prevent oil from flowing back to Roots pump and vacuum system when the pump stops. In addition, the oil ring pump has an oil tank. Ash and water vapor are separated and deposited in the tank. Ash is deposited at the bottom of the tank. It can be easily cleaned online without affecting production operation.